With the hateful outcry, sometimes foul degrading remarks against the Pope and Mr. Obama on the one side and the revered, deep emotional, sometime bordering on a worshipful, response on the other side, it throws the entire Christian world into deeper division enamored with greater confusion. If you are in either one of these camps I implore you to listen further. In order to cut through this confusion it is absolutely necessary to allow God’s Word to discern truth from error and put our feet back on the path of biblical prophecy and our eternal bond to its fulfillment. Although the actual words “New World Order” was never mentioned in any of the speeches last week at both the United States Congress and the United Nations, however, it would take a blind man not to see the blueprint of a New World Order, which not only fulfills prophecy, but sets the clock in motion to run through all the end time events. It is an imperative, and biblical, not to set dates, for each of the coming events could take longer to fulfill, as humanity seeks to lift up the hungry and oppressed, to reverse the effects of planetary destruction, to remove all weapons of mass destruction, to unite the entire world under global leadership, to institute international law and enforce it, and to cause all religions to respect one another’s beliefs and practices making them all inclusive within the New World Order. Although I clearly have issue with some of these plans, and know some to be quite un-achievable, I do recognize that all are within the prophetical calendar of world events. Therefore, we will approach each one by shedding the light of God’s Holy Word upon it to discern the truth from error. We will look first at those plans which should not impose a problem to the Christian community and then take a hard look at the negative plans that should give every Christian pause, thus leading them to heartfelt prayer and a united voice to be heard around the world. First, how should we view the hungry and oppressed of our world? Hopefully, there is not a Christian among us who would turn away from those who are hungry or who have been sorely oppressed by their local government. Your giving has surpassed most along with your prayers, missions, and support. I know that you have no problem with international methods of raising their standard of living though fair and equitable work. Jesus Christ fed the hungry on a number of occasions and taught his followers to do the same, but also making it clear that the poor would always be among us. The Bible says, “For ye have the poor always with you; but me ye have not always” (Matthew 26:11). Although this is true, the international effort in an attempt to eradicate extreme poverty and erase barriers to opportunity should not be a threat to the Christian. Secondly, to reverse the effects of planetary destruction referred to often as “Global Warming,” should not frighten the Christian as simply a liberal ploy to tax the wealthy. Not many of us are scientist and often times make our judgment on party affiliation or what we perceive from our own weather patterns. Let me be very clear, it really makes no difference to me if you believe in Global Warming or not, but what does concern me is do you believe in the Word of God that states that God’s wrath is poured out upon those who are destroying the planet. The Bible says, “And the nations were angry, and the wrath is come, and the time of the dead, that they should be judged, and that shouldest give reward unto the servants the prophets, and the saints, and them that fear thy name, small and great; and shouldest destroy them which destroy the earth” (Revelation 11:18). Air and water pollution, strip mining, fracking for gas, removing rain forest, pollution of our oceans along with many other things are not only destroying the planet, but causing death to humans, wild life, and fish in the sea. We as Christians should not fear this international effort to reverse the effects of poor stewardship of our home, planet earth. Thirdly, the international effort to remove weapons of mass destruction and to work for peace among all nations, again, should not be a problem for the peace loving Christian that desires that all men live in peace. Although, we know from prophecy that they will never really achieve this goal. For I am afraid there will always be wars and rumors of war along with the last Great War to end all wars, Armageddon. The Bible says, “For when they shall say, Peace and safety; then sudden destruction cometh upon them, as travail upon a woman with child; and they shall not escape” (I Thessalonians 5:3). Just because we as Christians know the end of the story and the probability that the coming Antichrist will make this claim of world peace, does not mean that we should work against such a noble quest or find fault with those who are working toward this end? Now, let’s look at the negative consequences of the New World Order, clearly a Blueprint against the Christian community and everything that we hold sacred. First, the New World Order will seek to unite the entire world under global leadership, to institute international law and to enforce it. This is nothing new for this has been sought since the founding of the United Nations and the writing of its preamble, but now much more aggressive. Again, we as Christians know that global leadership is essential for the coming Antichrist and his false prophet to come on the scene and lead the entire world to worship him as one who sets himself over all that is worshipped. His argument will be if all religions worship the same God then you should have no problem adding me to your plurality, and then willing to enforce it on all people. 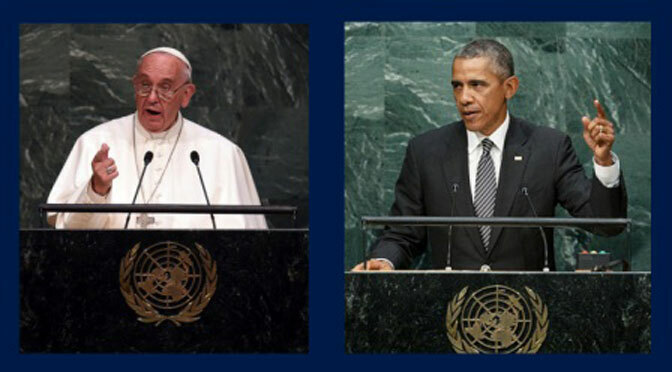 Pope Francis speaking to the UN said we need, “Codification and development of international law, the establishment of international norms regarding human rights, advances in humanitarian law, the resolution of numerous conflicts, operations of peace-keeping and reconciliation, and any number of accomplishments in every area of international activity and endeavor.” After reading and listening to the speeches of both Pope Francis and Barrack Obama at the United Nations the number of references to international law and international norms with its enforcement was not missed, especially when you consider the number of laws and norms that directly affect the Christian and his or her beliefs, as we shall see. To deny the fact that we are all sinners and quite evil in the sight of a Holy God is an unforgivable heresy. To deny the fact that we have been made righteous by the blood of the Lamb, leaves us in our sins and separated from a holy and righteous God. To deny the fact that no one comes to the Father except through Jesus Christ our Lord makes Him into a liar, destroying the exclusiveness of Christianity. I firmly believe and teach in a polarization between the faithful remnant and the unbelieving world! Yet it appears that through the new international norms set up by the United Nations that once all the terrorists have been soundly defeated, they will then turn their attention to the Christian who refuses to be assimilated into the New World Order. We will be seen, in their own words as “ignorant,” and as an “apocalyptic cult.” And don’t think for a moment that the United Nations won’t have the ability to enforce their international laws and international norms. Barrack Obama said, speaking to the UN on Monday, “And that’s why we should celebrate the fact that later today the United States will join with more than 50 countries to enlist new capabilities — infantry, intelligence, helicopters, hospitals, and tens of thousands of troops — to strengthen United Nations peacekeeping.” I pray that Obama is not making reference to the many UN vehicles that we have seen lately around this country. I just received word that this would also include an additional 8,000 troops from China. Clearly, the New World Order is upon us. Dear children, we must stand firm and not deny the faith.